News of another deal done over the Christmas period, the sale of the 36.45m Junie II, listed by Monaco Yacht and sold by bluewater. 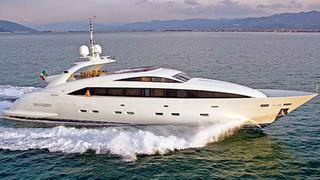 Built by ISA in 2008, she can accommodate up to 10 guests in 5 staterooms, including a split-level master suite. She is powered by three 2000hp MTU diesel engines in conjunction with triple waterjets which propel her to speeds in excess of 30 knots. She also features zero speed stabilisers. Junie II was asking €7,800,000.